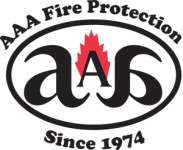 AAA Fire Protection Services is a family business with 40 years of fire protection and fire suppression services. We work with companies of all sizes throughout the city of Sacramento and all of the San Joaquin Valley. Our service team offers comprehensive services that include the installation and maintenance of Ansul fire systems as well as industry-specific requirements such as paint booth fire systems. We bring integrity and honesty to all of our clients, and are proud of the long-term and positive relationships that we have with local Sacramento businesses. AAA Fire Protection Services makes it easy to stay in compliance with federal and state regulations and we help businesses to reduce the risk of fire and to control fire if it should occur. Our services include emergency light installation which helps to create a safe environment in the event of a fire. However, we do more than just install emergency lights. Our emergency light service includes annual emergency light testing and we are fully equipped as an emergency light repair business. In short, we install emergency lights, come back periodically to make sure they work, and if they don't we repair them. We make it easy to create a safe working environment and in the event of a fire, we make it easy for people to escape.